Free Cervical Screening for Women of Nairobi! On Wednesday, Robbie, our pastor, picked up about 5-6 women to take for a free breast and cervical cancer screening. A team came from Loma Linda to put on this clinic and the women of Nairobi are so excited. Joyce, the lady who helps us with the boys while we attend class, and I met the ladies from our church to get in line for their free screening when we discovered there were women waiting from the day before! Needless to say, our women didn't get seen but praise the Lord, the guy from the head of the clinic has been in contact with me via email and arranged for our women to come and get an appt. His name is Mark and we've been in touch about this clinic for about a year. Mark is a Christian and has asked for your prayers during the clinic. He will come worship with us at church on Sunday and have lunch with us afterwards. This appt. was such a blessing considering the team will only be here till about March 11th and the women are served on a first come first served basis. The women from our church come from all different areas but Joyce lives near us in Tigoni, making it very difficult for her to get there early. Our women went away glad in their hearts that the Lord provided this screening and an appointment for them. Also, this week we checked out another car. A Toyota Carib. Jonathan took the car to the mechanic and everything checked out great! We made an offer on the car and negotiated pricing today! Since we just worked out the pricing of the car, we are still going to be finalizing paperwork and such. We are so glad we are finally going to have a car! PRAISE THE LORD! So today was especially emotional because we found out we got the car, we had to say goodbye to Joyce and our sweet friendships from Language School AND we got a package from our care team back at Refuge. Apparently the package was sent way back in December and we JUST got it today. Let me tell you how touched we were...We opened the package to find two hand-knitted beanies for our boys that had the colors of the Kenyan flag and said, "Kenya" on the front. These beanies were made by one of our girls in the youth group at Refuge, Jasmine. Our team sent birthday and Christmas cards for all of us, a book for Jonathan, a Phil Whickham CD, a new Veggie Tales Christmas DVD (that the boys are watching as we speak) and a touching DVD that brought Jonathan and I to weeping. The DVD was a slideshow put to music with all of our favorite people from Refuge holding up signs that said, "Merry Christmas Ferguson Family". Our friend, Jack, took pictures of the Jr. High all together with a sign that said they missed us. We can not tell you how much this touched us. The fact that they went to so much effort and seeing all of our friends smiling faces brought joy and gladness to our hearts. It also made us long for home. Thanks to our care team and to all our brothers and sisters at Refuge. We really want to try and figure out a way to show you all so bare with us as we figure it out. We love you guys! The last bit of news is our move starts on Monday. 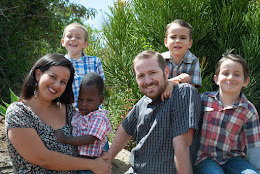 Josiah, Christopher and I will spend the night at the new house on Sunday night and Jonathan will come back to Tigoni so he can be at the house when the moving truck comes. Please pray for this day, we have SO MUCH going on. This is actually the day that the appt. was made for our ladies at church so I am going to Kenyatta National Hospital and then I'm going to rush back to help with organizing things in and putting them in their right place. We are so excited about our new place and praise the Lord for all He's done. AND we'll get to Skype with friends and family without a problem on the internet. Please pray as our church is beginning a new class at the Bible School and we have about 3-5 eager students. This school isn't designed to give people a degree in theology but to go through all the books of the Bible and get them grounded in the word of God. We are soooo excited and Jonathan is excited to FINALLY get back into teaching. Thank you Jesus! We are winding down from language school and can hardly believe next week is our finals. I can hardly believe we are about to end our time at school. This school has been such an unimaginable blessing to our family. There are hardly words to describe our experience here. We've made some amazing friendships here and it will be difficult to leave. The teachers here have been like our parents and mentors. We feel like kids that are going to make our attempt to move out of "mom and dad's place" for the first time. We look forward to posting some pictures when our connection to the internet is better. Lately I've had some phone conversations with my mom and grandma, and in trying to articulate the blessing of being in Kenya, there are frustrations that surface about the injustices which happen to the people of Kenya. It's so easy to be frustrated when we read in the newspaper about discontinuing funding for children who need medicine for Malaria while then turning the page of the newspaper and reading about members of parliament who give themselves a raise when they are already getting an enormous salary. There are so many frustrations and we can get so caught up in the headache of the way things are run here and how they oppress the people. It's difficult. Today we had lunch with a Kenyan couple whom I had just met and their perspective was refreshing and encouraging. I told them how it seems that people don't consider the enormous "in your face" corruption a problem because it doesn't affect their everyday lives. Her perspective really gave me some insight. She had said that the people of Kenya had been under oppressive governments before and the people never rose up for fear of gov't. But now that there is more "freedom to speak out" it has created a society of people that don't care about the level of corruption that people are involved in because it doesn't directly affect their lives. It has also made the people jump into "survival mode", where everyone just looks out for themselves. This woman explained about the frustrations and injustices she has seen. She shared her experiences about opportunities that the Lord has given her to speak directly to some corrupt official responsible concerning a few matters. Before approaching them she was confronted by others who asked her the question, "Well, who are you?" Good question. She thought to herself, "Who am I to approach these people?" After tracking down this certain person, she was just about to give them a "piece of her mind" when out from her mouth poured words of encouragement and edification to this person who was responsible for matters that brought injustice. She could hardly believe the words that were coming out of her mouth. This was not the plan! But God had other plans. The point was not that this person was doing an amazing job but it's God's heart to win the soul of the person. It reminded me of this scripture (Col. 4:5), "Be wise in the way you act towards outsiders; make the most of every opportunity. Let your conversation be always full of grace, seasoned with salt, so that you may know how to answer everyone." (NIV) When we think the person deserves justice, He gives them grace so that they may come to know Him. This person had opened up his heart and let her know that there were corrupt officials above himself and that if she wrote letters and made " a stir" about the situation, he would be behind her. What a blessing! I know this story is a bit vague but I'm sparing the details to share about how much I was encouraged today. Kenya is a country where there are so many relief funds and aid from other countries and organizations and still there are your poverty stricken folks and very rich folks. Seeing money falling into the hands of thieves is so disheartening when so many people can't get their basic needs met. Corruption runs so deep in the roots of Kenya. But yet there's life here. There's a need for Jesus in this country filled with poverty, business, robberies, corruption, missionary aid groups and NGO's. There's a proud Kenyan spirit here that's just contagious despite the hardship. This country doesn't need more money but they need Jesus. He's the one that can change the hearts of the people, that will turn them from their sin. Jesus gets to the root of the evil and that's the heart. It was refreshing to remember the reason why we came. Not so we can do or be everything the Kenyan people need. But it's to give them the only thing we have and that's Jesus. We can feed hunger for a while but God is the giver of the bread of life. We could dig bore holes to help the people get a drink but God is the one who quenches with living water. He's the provider, He's the savior, not us. And that is a huge lesson that I'm learning and will continue to learn here, I'm sure. The first time I flew into Bangkok, a friendly Thai passenger gave ma a litany of scenarios and characters in order to avoid getting mugged or conned. I got similar warnings when I walked through Oliver Tambo airport in Johannesburg. My response was always, “Thanks, but I’’m from Nairobi. In all my trips in and out of the city, whenever someone asked me where I was from, I never said, “Kenya.” It was always, “Nai.” It sounded cocky, as if to say, “You do not know my kind.” You see, nothing fazes us. Tried and tested. Nairobi does that to you. In my 10 years as a newspaper columnist focusing on social commentary, I learned that the only way to see Nairobi is through its contrasts. It’s a bit of colonial relic with its historical buildings, the most significant being the Railway Museum, where the story of ‘Nai’ begins. At the same time, it beckons to be one of the continent’s leading, cosmopolitan cities. In the late 1890’s. it was called Ewaso Nai’beri: a Maasai homeland, known as the place of cool waters. Thanks to English affectations, it was mispronounced, ‘Nairaby’. It became a British railway camp, a rest point as they built the lunitic express – an elaborate attempt to capture a virgin country’s resources. Today, it is a city that blends all humanity, where its easier to learn Japanese than it is to learn Kimeru or any of the other local languages, for that matter. It could also be seen as a basket case, if you train your eyes on the poverty that defines the majority of it’s citizens. Or you might just mistake it for a Western capital, if your priority is enjoying ice-skating in the tropics. It’s the city of Barrack Obama’s father, knocking back Johnny Walkers at the swanky United Kenya Club. The same city claimed by President Obama’s lost brother George, who now makes headlines from a hovel in Dandora. It’s a city of contrasts, like the city that hosts the headquarters of UNEP and UN-habitat offices situated less than 20kms from the largest slum in Africa. But man, you can still get a world-class cappuccino. I recall when Nairobi was known as the ‘green city in the sun’. Post cards from Nairobi composed the picture of a giraffe in the background of the Kenyatta Conference Centre. Praises sung about the friendly-faced locals added to this beautiful mosaic of an idealized modern African city. The people were very hospitable and the patriotic slogans were ‘Jambo Bwana’, ‘Karibu Kenya’ and ‘Hakuna Matata’. The illusion of this has slowly ground down. Nairobi became known as Nairobbery. That reality was best captured by pioneer hip-hop band Kalamashaka, in their hit song ‘Tafsiri hii’. The line that became an anthem among the urban youth was, ‘polisi au jambazi’. Cops or robbers? The difference was the same. The common trait among Nairobians was that we had all suffered a break in, a mugging or a carjacking; at least paid a bribe to the police for no crime, or greased a government officials palm before you got a basic service that was free of charge. In those days, every tourist was handed a survival handbook. Every sentence began with the words, Avoid, Don’t or Stay Away. I got accustomed to power rationing. Dry taps. Clogged traffic. Potholed roads. All of it due to the bizarre political policies that squeezed the life out of my personal progress. I was here when the war correspondents made it their hub. Somali was burning. South Sudan was in turmoil. Rwanda in the midst of a genocide and the LRA running riot in Uganda. Nairobi was the luxurious haven of peace in a region plagued by conflict – a place to chill out and spend your hardship allowance. At the turn of the century, at the dawn of a new era, Nairobi was the centre of new optimism. Investors were back by the droves and the economy was growing. It became known as one of the most important business capitals in Africa. For expatriates, it was tropical paradise – a dream posting that would leave any expatriate wife feeling kind of ‘OK’. It felt almost like home, but only that the weather was better. The middle class was expanding. There was a real estate boom. Then the bubble burst after election mass violence rained havoc on our little parade of prosperity. I watched the same buoyant expatriates moaning about the rising cost of living and the need for a fresh look at their compensation packages. Despite the ups and downs, in and outs (and as prickly as she is), she is still a rose. Nairobi has instilled in me the capacity to survive and reinvent despite anything that life throws at me. I am in many ways an embodiment of a city that prepared me for the worst of everything; yet this city simultaneously taught me that ‘beauty lies in the eyes of the beholder’. All we have to do is look behind what we see. Today, Nairobi is rising again – on another turn upward. I see a burgeoning media industry, a surge of creativity and expression. Yes, we have more bars and restaurants and nightclubs. But that’s not the soul. For me, Nairobi is cool because of its hardships and not in spite of them. This gives us an edge over the rest. We’re tested. We’re tried and we’ve come through. We are so excited and thankful. We'll post pictures soon!!! !